For this recipe I made a quick compote out of blackberries and just a little bit of sugar to offset any tartness since the berries aren’t in their prime growing season yet. The compote pairs beautifully with light and fluffy ricotta pancakes. The secret of which is to whip beaten egg whites into the batter. It takes a little extra time, but it is completely worth the effort. 1. In a small saucepan over medium heat, add the blackberries, Meyer lemon zest, sugar, and water. 2. Stir to combine and cook until the water starts to thicken and the berries lose their shape, stirring occasionally. This should take about 10 minute. 4. In a medium bowl, whisk together the ricotta cheese, Meyer lemon zest, juice, sugar and egg yolks. 5. Gradually stir in the flour until just combined. 6. Using a stand or hand mixer, whisk the egg whites with a pinch of salt until stiff peaks are formed. 7. Take a large spoonful of the eggs whites and stir it into the batter. With the remaining eggs whites, fold in half, slowly turning the bowl while you fold. It is fine if there are some white streaks left in the batter before you add the second half. Fold in the remaining eggs white and set the batter aside while you heat up a griddle or non-stick pan on medium heat. 8. Add some butter to the pre-heated pan, and swirl to coat. 9. Add about a 1/4 cup of batter and cook until bubbles start to form on the top and the edges begin to brown slightly. 10. Flip the pancakes and cook for an additional minute. 11. Remove and keep warm, while you repeat with the remaining batter. 12. 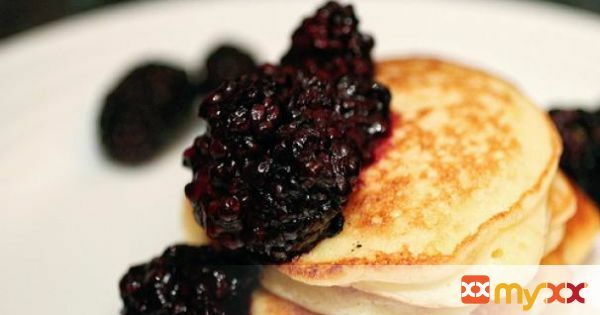 Serve the pancakes with the blackberry compote and if you like a little pure maple syrup.